Why can't I change my business currency? I deleted my Wave account and I need it back – what do I do? Why can't I change my business type? When you first create a business in Wave, you're asked to choose your business's primary currency. This becomes your default business currency, and it cannot be changed after it is set. 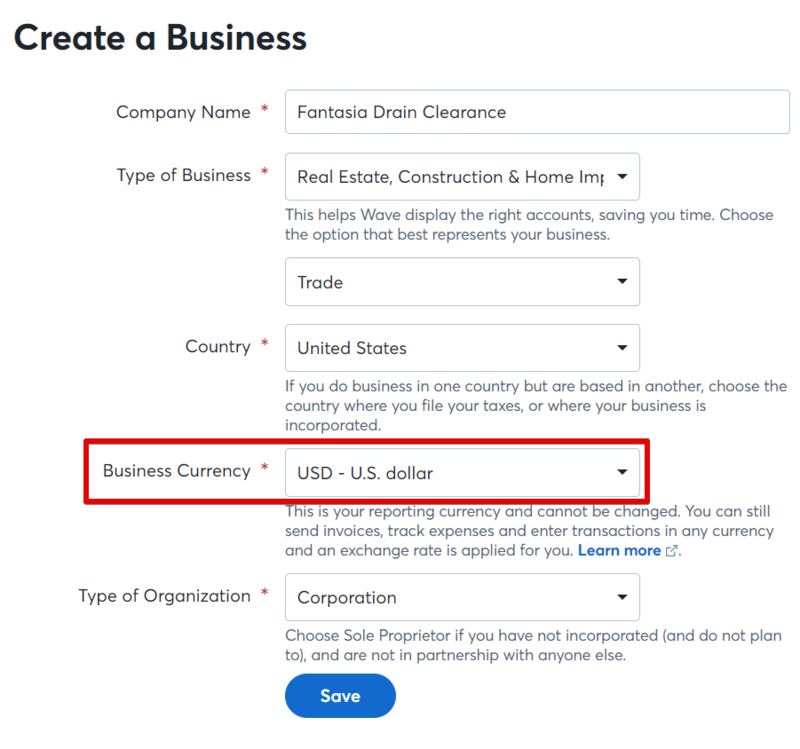 This article explains why this restriction exists, and some options if you have created your business with a different business currency than you intended. When you first register for Wave, your country and currency are detected, and these are suggested when you create your first business in Wave. You can choose a different business currency during initial account creation by clicking the Change this link. Why can't business currency be changed? While some large multinational businesses operate their management accounting in one currency while reporting and filing tax in a different currency, virtually every small business – which is what Wave exists to serve – reports in the domestic currency of where it is located and pays tax. US businesses report in US Dollars; Canadian business report in Canadian Dollars; UK businesses report in British Pounds; and so on. But what happens if you are running a small side business and relocate to a different country, where you will pay tax to a different taxing authority, in a different currency? The simple answer to this is that you are now running a different business! It may feel the same. You may be coaching or consulting with the same clients as before, and using the same business name as before, but it is a different business. You have a 'Before-I-Moved' business, and an 'After-I-Moved' business, with obligations and dealings in two different jurisdictions. As mentioned above, if you move your business to a new country (and assuming you are not trying to account for a large multi-national corporation in Wave!) then it is, in essence, a new business. The Wave part of this is easy. Simply create a new business. The accounting part – if you want to do this 100% correctly – is not so easy, and you are going to need the advice of TWO accountants: an accountant in the country you have moved from, to help you with the impacts of closing or transferring your business overseas, and an accountant in your new country to help with creating a new business and accounting for the value that you bring from your pre-existing business. This would be a great time to click the "Find an Accountant" link on the left navigation bar in Wave, and start asking some questions!